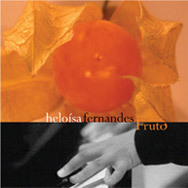 The music in this album gestated for ten years, a period when Heloísa Fernandes raised young children and taught students in her studio. Throughout this time she collected thoughts and developed them into a family of new compositions, the fruto (fruit) of a decade. The time came when both her children and her compositions were ready to stand on their own, and she took the latter into the studio with her musical friends, each distinguished musicians with careers of their own, and recorded them for the first time to make the album Fruto. The opening work, Vôo (flight), embodies not only her step forward in recording and performing her compositions, but is a microcosm of her artistic world, reflecting her love of Brazilian ideas and rhythmic drive and her way of shaping them. Colheita was written for percussionist Naná Vasconcelos, who performs as a guest on the recording. Criança (children) is dedicated to her son and daughter. And unlike all the other tracks, whose arrangements were rehearsed and brought to the studio, Suite das meninas was a duo improvisation created during a break between the recording of pieces. The engineer left the microphones open without the musicians knowing it. The power of this work came out of nowhere and surprised the musical press in Brazil. “She enters our discography,” wrote esteemed critic Arthur Nestrovski in Fohla de São Paulo, “with impressive security and considerable daring.” He goes on to cite the recording's many strengths, as have reviews from around the globe.